This beautiful beveled glass candleholder is called Wolf Pack. It features the fantastic artwork of Al Agnew hand painted on all sides. Comes with a tealight candle. This would make a wonderful and unique Wolf gift. It is securely packed in a white gift box. 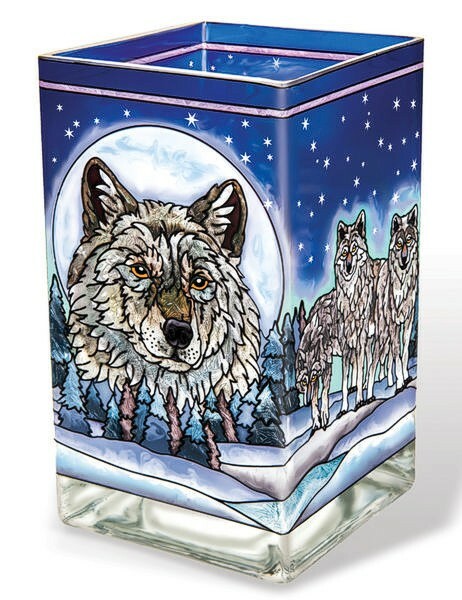 For more Wolf candleholders, visit the Wolf Home Decor Section of our gift shop. DO NOT USE SOLVENTS ON THE PAINTED SIDE. A lightly dampened cloth can be used to clean the painted side. A mild glass cleaner may be used on the unpainted side. Size: 3.5" X 3.5" X 6"